A quick post tonight using Stampin' Up! Embossing Paste that has been coloured with a drop of Soft Suede re-inker. The paste is applied through the brick pattern mask from the Pattern Party Decorative Masks set and allowed to dry. I used water colour paper for the base so that I could sponge and spritz the brick pattern after it dried. I really like the interplay of textures when working on water colour paper. 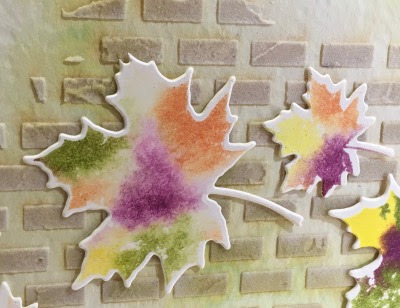 I combined the use of Embossing Paste with the wonderful and versatile Seasonal Layers Bundle, choosing the leaves framelits for this card. I can just imagine the autumn wind blowing the leaves in front of my house! The water colour paper is matted onto Copper Foil and then onto Old Olive card stock. The card base is Thick Whisper White. I introduced the technique of Baby Wipe stamping for the leaves - many of my customers had not tried that technique and they fell in love with it. It looks particularly good on these leaves as they cut our with a white rim that highlights the shape of the leaf and the beautiful colours used. And when they blend you get so many other lovely neutrals. This is the first of a series of 4 cards I made using the Pattern Party Decorative Masks. I'll post the others over the next couple of days. If you haven't already tried the Embossing Paste, I encourage you to do so. It is fun and can be manipulated in a variety of ways.